I-V 400 is the ideal solution for the ordinary and scheduled maintenance of photovoltaic systems. With I-V 400, searching for possible failures and problems in systems is extremely rapid, efficient and intuitive. 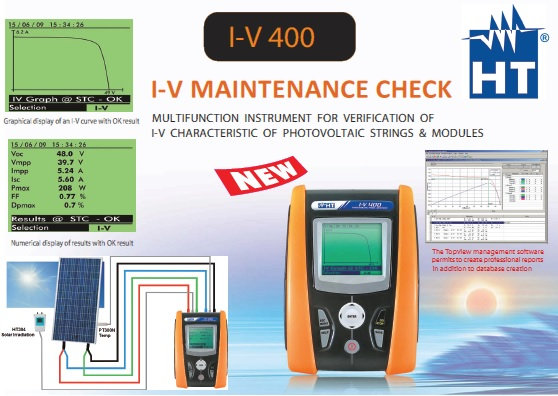 I-V 400 carries out the field measurement of the I-V characteristic and of the main characteristic parameters both of a single module and of module strings. The instrument measures, together with the I-V characteristic of the device being tested, also the values of its temperature and incident irradiation. The acquired data are then processed to extrapolate the I-V characteristic at standard test conditions (STC) in order to proceed with the comparison with the nominal data declared by the modules’ manufacturer, thus immediately determining whether or not the string or the module being tested respects the characteristics declared by the manufacturer. Output current or voltage from the module or string is measured with the 4-terminal method, which allows extending the measurement cables without requiring any compensation for their resistance, thus always providing accurate and precise measures. In its internal memory, I-V 400 manages a database of photovoltaic modules, which can be updated at any time both via the management software and directly on the instrument. Together with the measurement of the I-V characteristic and the extrapolation of the characteristic at standard test conditions, I-V 400 compares the obtained values with the values declared by the manufacturer, immediately providing the OK / NO result of the test. The operator must not do any calculation, nor any difficult operation. The instrument carries out the comparison rapidly and automatically.